For new employees, talking with customers on chat can be a real nightmare. Not only do they need to get to know the product as fast as you can, but also need to learn how to deal with impatient customers. No matter how quick learner you are, you need to go through this road anyway. We’re aware of that, as we ourselves handle over 300,000 chats a year. And want to help you handle your chats! 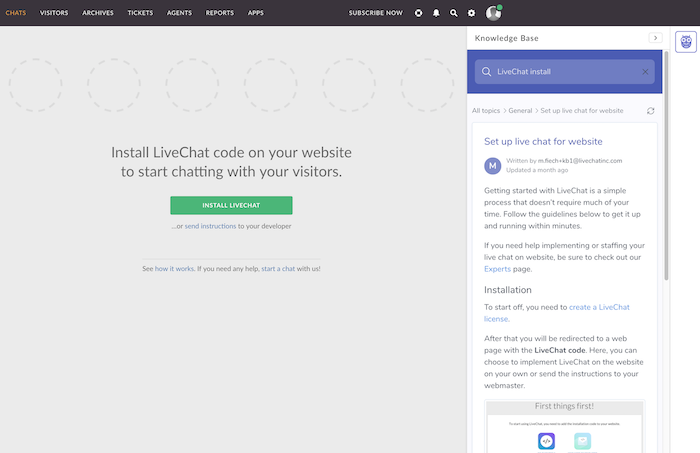 We’ve created Internal Knowledge Base you can install in the LiveChat application. The Internal Knowledge Base is created by a company strictly for internal use. It’s a place where all employees can find important information about the product they work with. Having such information in hand, allows them to provide better and faster service for customers. Without a knowledge base, new employees need to ask their teammates about… almost everything. With the knowledge base, you have answers to all the important questions from customers, prepared by experienced teammates right in the LiveChat app. Internal and public knowledge bases are slightly different. Some of the information in internal knowledge base might be sensitive and you don’t want to share them with customers. This information is for employee use only. The good news is, that if you have a public knowledge base, you can easily copy it to the internal one. You just adjust it for the employees first. And if you don’t have any knowledge base yet, if you create a knowledge base internally, it will be easier to create a public one, which will be a great help for customers. I’m not a support agent, but from time to time I chat with customers. 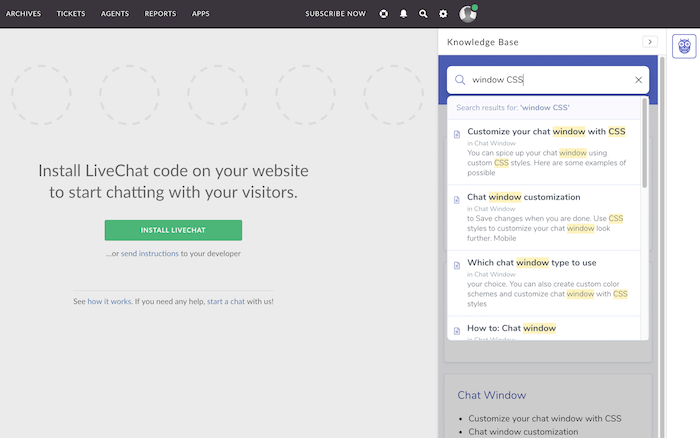 I remember that every time I was getting ready for chatting, I opened our public knowledge base in the browser, and I was ready to find answers to customers questions there. But that meant I had to leave the application, which took time and caused me stress. I knew a customer was waiting. With the Internal Knowledge Base, you have all the questions in the sidebar so you can see them while chatting. You can also search through the knowledge base, which makes EVERYTHING faster. It’s especially great for new employees who don’t know the whole product. They are not sure where to look, they just type in the “phrase” customer is asking about, and the answer will come up. A search function can do wonders for the accessibility of your articles. When they start piling up, it becomes almost a necessity. 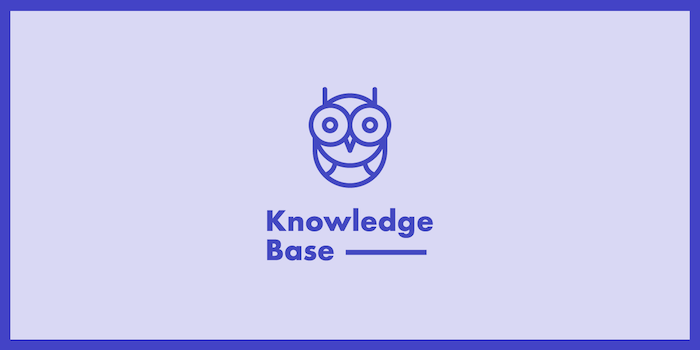 The rules you should apply to create an internal knowledge base are quite similar to the public knowledge base. You’re thinking of your customers and what they ask about, but you also consider what your employees might not know. Especially the new ones. Gather all the information you want to cover in your internal knowledge base. Get feedback from experienced employees – they will tell you what are the most common questions from new employees. Or what are the more complex questions that most employees have to answer. Then, divide them into sections/topics. It will help the agents look for the right content and improve the search. To make the internal knowledge base more transparent and easy to read, use our format text. It includes creating lists, headers, the body of the text and links. When creating content, if you have doubts, better explain something than risk showing an article that is too hard for beginners. Content explains a lot, but a picture can mean a thousand words. A screenshot can save you many words of instructions and show how to do something step by step. Once agents see how something it’s done, it’s easier for them to explain it to the customer. They can also show the graphic. Using keywords and tags make the search also more efficient. The more precisely you will tag the articles, the better your “search” will be. Take a look how the search works in our internal knowledge base. It’s not a secret that the better you know the product, the higher confidence you have in providing customer service. By having the knowledge base inside the application, you allow everyone to learn the product quicker. Give it a try and see how it speeds up your work. You don’t have to create 186 articles like one of our customers. Start using it and see how it works for you. That’s what Ryanair, our customer, is doing these days. Integrate with Knowledge Base, create some articles and let us know what you think. In case of any questions, don’t hesitate to chat with us.